There is so much to do and see in and around Canterbury! It’s been a hard task whittling it down to just ten. But here are our suggestions for the top ten things to do in Canterbury to get a real feel for this historic area. No stay in Canterbury would be complete without a trip to this iconic landmark. Founded in 597 Canterbury Cathedral is the seat of the “Primate of All England”. The Archbishop of Canterbury himself. There is much to contemplate within the cathedral precincts. Just a 20 minute stroll from Yorke Lodge. From The Martyrdom – the site of Thomas Becket’s murder in 1170 – to his shrine in Trinity Chapel. Here Becket’s tomb is marked by a single burning candle. It was destroyed on the orders of Henry VIII. This doesn’t even scratch the surface though. Visit https://www.canterbury-cathedral.org for much more information. As a working community services and events are held at the cathedral. The website will have details of any forthcoming closures. Described as “the loveliest castle in the world” Leeds Castle is a must see! It is easily accessible by car from Yorke Lodge. The journey takes as little as 40 minutes. There is something for all the family when you arrive. In addition to the beautiful castle buildings there are over 500 acres of gardens and parkland. These include the moat and extensive lakes. Allowing wildfowl to thrive in their natural habitat. Leeds castle has a long history. It was built as a Norman stronghold. But it soon became a royal residence. Even medieval queens couldn’t resist its tranquility! However, towards the end of the 16th century it became a private home. The last owner, Lady Baillie, died in 1974. She left the castle to a charitable trust. It has been open to the public since 1976. Among the many activities on offer are the Squire’s Court and Knights’ Realm playgrounds. Perfect for younger visitors. Or lose yourself in the Maze. Then adventure into the spooky underworld grotto! Jousting knights and intrepid explorers deserve rewards! Refreshments are available in the castle’s restaurants and cafes. Visit https://www.leeds-castle.com for full details. Known as The Beaney, this is Canterbury’s central museum. And it has a distinguished history. Completed in 1899 the building is Grade II listed. It takes about fifteen minutes to walk from Yorke Lodge. Upon arrival it becomes obvious why it was originally called “The Tudor Revival Beaney Institute”. There is a wealth of art, artefacts and military memorabilia on display. The Beaney also houses Canterbury’s library. Two other museums deserve a mention. Both are within a twenty minute walk of Yorke Lodge. So three for the price of one, as it were! Or just downright cheating? The Canterbury Heritage Museum, Stour Street. This museum is in “one of Canterbury’s finest surviving medieval buildings”. From mammoths to Bagpuss Canterbury’s heritage is truly eclectic! The Canterbury Roman Museum, Butchery Lane. This is Kent’s only Roman museum. Thus demonstrating how pivotal Canterbury was under the Romans. Not to mention what the Romans did for us! A ten minute walk from Yorke Lodge. Cross the River Stour at Whitehall Road into the gardens. The Westgate Gardens River Walk follows the Stour to West Gate. A former historic entrance to Canterbury. The gardens originally belonged to nearby Tower House. This is an early Victorian residence. The last owner was Catherine Williamson. Catherine became Canterbury’s first female mayor in 1938. After her death the house and gardens were given to the City of Canterbury. Tower House is now home to the mayor’s offices. The gardens have a strong Roman link. Until the Civil War this area bordered the Roman City Wall. However, in 1641 Cromwell’s army destroyed what remained of the wall. You may prefer to take a punt on the river. There is a slipway in the gardens from which to do so. 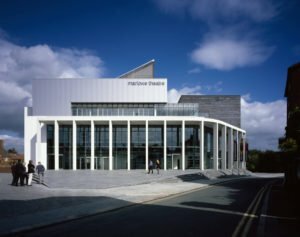 In October 2011 the Marlowe Theatre relocated to a brand new building. It is now a major regional venue with a full and varied programme. Musicals include Sister Act (June 26th-July 1st) and Mamma Mia! (July 11th-29th). The hilarious West End smash hit “The Play That Goes Wrong” is also coming to the Marlowe (July 31st-August 5th). For family fun “Dinosaur World” (11th-13th August) is an interactive “brand new dino-mite adventure”. And who doesn’t love the “The Railway Children” (15th-19th August)? But there’s much, much more! Established comedians such as Jimmy Carr (July 4th). Or tribute band “T.Rextasy” (July 3rd). The Green Room is ideal for a relaxing pre-show dinner. There is even the option to have pudding in the interval! There are three bars, one on each floor of the theatre. These provide comfortable areas for pre-show and interval drinks. The Green Room is open for light bites and coffee at non show times. The Marlowe Theatre is a fifteen minute walk from Yorke Lodge. Howletts was founded as a private zoo in 1957 by John Aspinall. It opened to the public in 1975. The protection of animals has always been at the heart of Howletts. It continues today as a conservation charity. Through its breeding programme Howletts is committed to returning animals to the wild. Thereby ensuring survival in their natural habitat. The Park is home to over 400 animals. These include rare and endangered species. Yet there are more tigers, gorillas and leopards here than in any zoo in Kent. And don’t get in the way of the UK’s largest herd of elephants! The park also offers a wide range of activities. From walking with lemurs to the Treetop Challenge. Only fifteen minutes by car from Yorke Lodge there is something at Howletts for everyone! 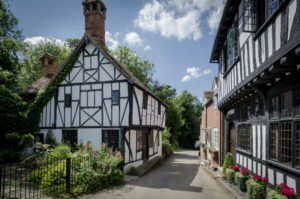 Chilham is also a fifteen minute drive from Yorke Lodge. This picturesque Kentish village is centred on the Market Square. It is notable for its many listed buildings. Of particular interest is the 15th century church at one end of the square. At the other end is Chilham Castle with its 12th century Castle Keep. The Chilham Castle we see today is a crenelated Jacobean manor house. It was built in 1661 on the site of the original castle. And it remains “one of the finest mansions” in southern England. The castle s still inhabited, but private tours can be arranged by appointment. The gardens are frequently open to the public. But again, private viewings are possible. The Chilham Park Equestrian Centre is in the castle grounds. The centre is holding several events this summer. There are two pubs, a restaurant and tea shop in the village. As well as the post office and gift shop Chilham has several other shops. It also offers a sports centre and children’s playground. Chilham Village has been used many times as a film location. Including for a television adaptation of Jane Austen’s novel, “Emma”. This is interesting because Jane Austen was a guest at Chilham Castle on several occasions. Together with Canterbury Cathedral the site of St Augustine’s Abbey is a UNESCO World Heritage Site. It was founded in 598 by St Augustine after his arrival from Rome. As a Benedictine monastery it housed St Augustine and his brother monks. The abbey became a burial place for religious dignitaries and Anglo Saxon kings. It was also a seat of classical learning. After the dissolution of the monasteries Henry VIII kept part of the Abbey for himself. The rest was dismantled or sold. A succession of leases was granted by the crown to noblemen. But they allowed the Abbey to fall into disrepair. Until in 1844 money was raised by Alexander James Beresford Hope for a restoration programme. However, an air raid in 1942 caused irreparable damage. Today the site is operated by English Heritage. There is a museum with ancient artefacts found during excavations. There is also a picnic area and a gift shop. You should not climb on the ruins as they are dangerous with sheer drops. But it’s fine to explore them with due care and attention! This relaxing round trip lasts about 40 minutes. So rest your weary feet and let someone else take the strain! Your guide will show you the sites of this beautiful city from the River Stour. The river tour is a peaceful opportunity to identify some of the many attractions not mentioned in our Top 10. The Alchemist Tower, Greyfriars Chapel and Ducking Stool to name but three! Unless in a group of 12 or more, there is no need to book in advance. Just turn up at the Kings Bridge. Boats leave every 15-20 minutes during the summer. The only way to explore the heart of Canterbury is on foot. So get the most out of your visit! Take a tour with an official Green Badge guide. The walks are 90 minutes long. The guides are informed and informative. They will entertain you with tales of those who have walked these very streets. Whether historical figures, artists or writers, no “cobblestone” will be left unturned! Tours are twice daily during the summer at 11am and 2pm. They depart from the Old Buttermarket at 39 Burgate. This is a 20 minute walk from Yorke Lodge. You may want to get there early for an energising tea or coffee! Get your walking shoes on and go to http://www.canterburyguidedtours.com for directions! If, you’d like any other ideas, do ask Vicky.